This post was sponsored by Smithfield® as part of an Influencer Activation for Influence Central and all opinions expressed in my post are my own. Summer is in full swing around here and for us, that means grilling! We’re hoping to limit our trips to restaurants and embrace cooking at home this summer and these great summer grilling recipes have us off to a great start! We love cooking together and it’s something we do most of the time anyway. But the end of the school year got a little out of hand with quick stops and pizza so it’s time to get back in the kitchen. I mean, let’s be real. It happens. I have a couple quick and easy recipes to share and I hope you love them! 30-minute(ish) meals are my jam because really, who has more time than that during the week? 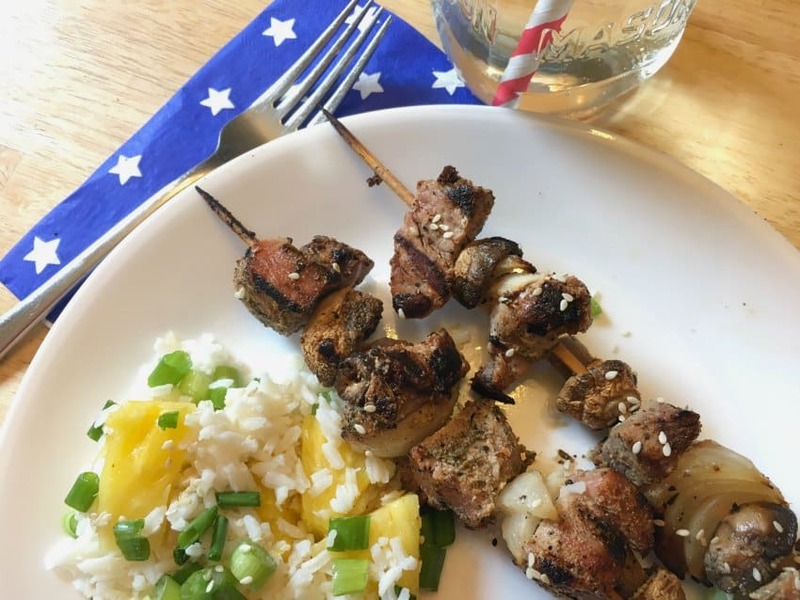 To kick off summer, I was excited to create a recipe using Smithfield Marinated Fresh Pork on the grill. If you’re like me, grilling can seem like a time-consuming process, but it really isn’t. I must have that mentality because grilling has always come with a party and that can take a lot more preparation. 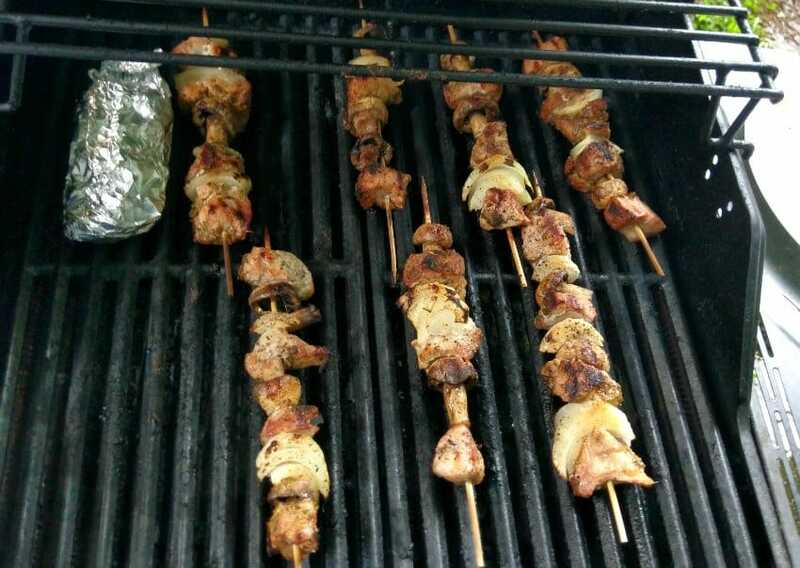 That said, these kabobs made with Smithfield Marinated Fresh Pork are quick and super easy to prepare. 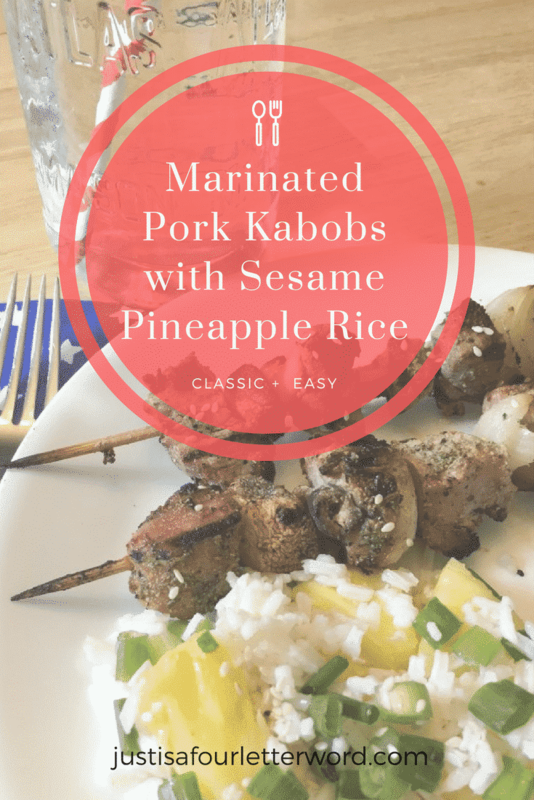 They’re great for a weeknight meal and so delicious when served with sesame pineapple rice. It’s also a great meal to divide and conquer, which saves even more time. In fact, my husband loves grill time and I’m quite happy to stay in the kitchen chopping veggies so it works out for both of us! 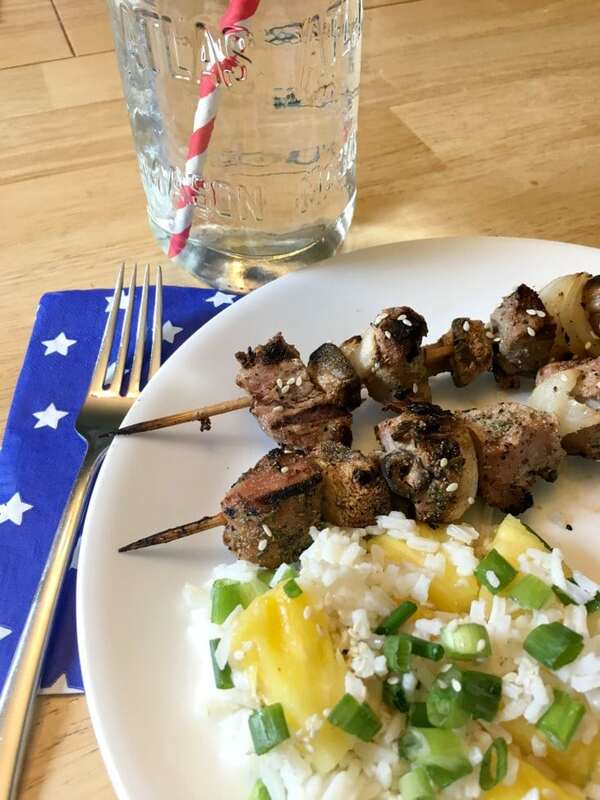 Using a Smithfield Roasted Garlic & Herb Marinated Fresh Pork Tenderloin made grilling some tasty kabobs super easy. It’s made from 100% fresh pork and has no artificial ingredients. And since it’s already seasoned, you can just open the package and start putting your delicious meal together. The rest is as easy as chopping and bringing together some really yummy flavors while the rice cooks. Doesn’t get much better than that. 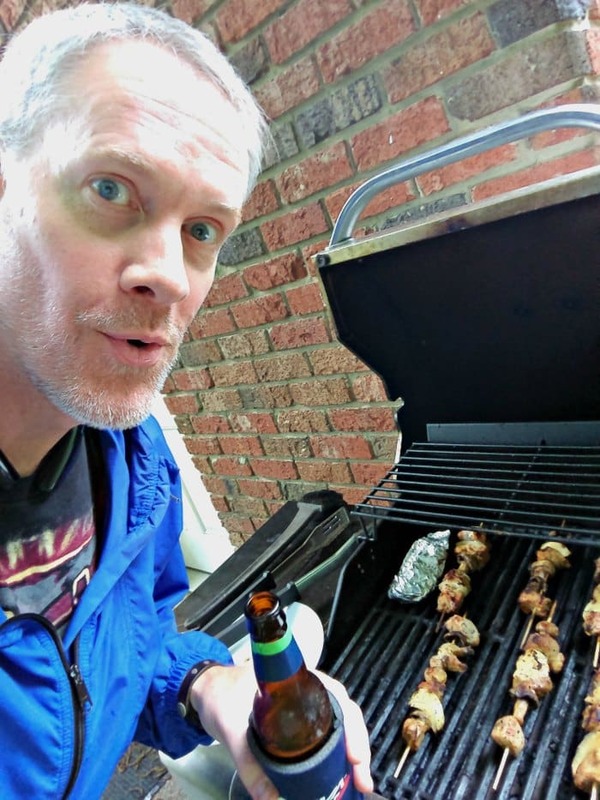 I don’t think grilling has to be a gender thing, but Jerry sure loves getting outside with a beer and his music so I leave him to it. We also love getting the kids involved by letting them bring plates and foil down and whatever else he might need. Selfishly, I like how it all makes for less work on my end. I’m getting smarter in my old(er) age! My secret to meals the whole family can enjoy lies in the ability to dismantle it. Jerry and I eat the meal you see in the picture below but the boys prefer to eat the pork, rice and pineapple all separately. After this meal, Oscar decided he liked mushrooms so I guess we need to add more of those to future shopping lists. Score! 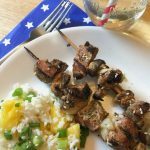 This is a great meal for any time of the week this summer and of course would make a holiday cookout delicious! 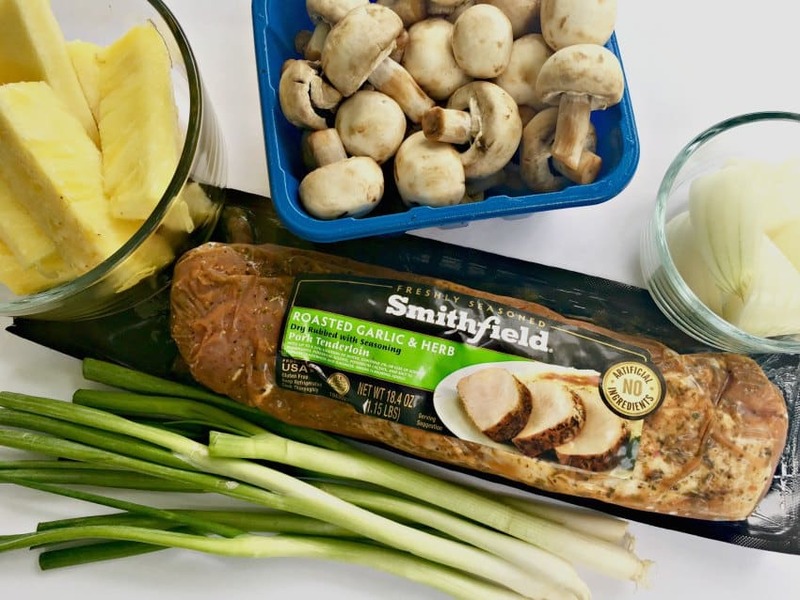 Before you shop, grab a $1.00 off coupon on Smithfield Marinated Fresh Pork to use at Food Lion. And even better, make sure to enter the “What Can you do with 30?” sweepstakes by submitting a tip for getting dinner on the table in 30 minutes or less for a chance to win a trip to Napa Valley! Smithfield Marinated Fresh Pork is available at Food Lion. Check out all of the Smithfield products on their website and be sure to follow them on Facebook, Twitter and Instagram for more great recipes. Cook rice according to package instructions using 1 TBSP sesame oil instead of butter. I always like trying new (and easy) recipes to switch things up when we get in a rut. I’d love to hear your family favorites too so feel free to share in the comments. Enjoy!